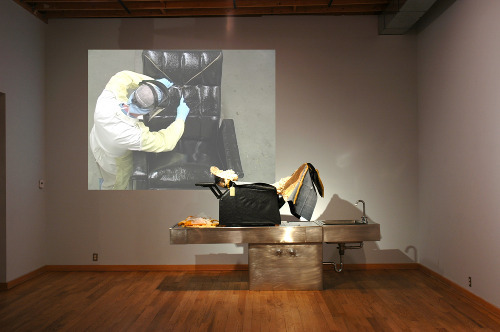 August 16, 2012 – News, exhibitions, openings and events. Five video works and installations by artists: Jason Ferguson, Jordan Wayne Long, Thomas Friel, Joe Sobel, and Timo Ohler. Opening Friday, August 17, 6:30-9:30pm. Show runs through September 8. Show runs through December 9. African Art and the Shape of Time explores how African art gives material form to diverse concepts of temporality, history and memory. African art is often interpreted in Western analytical frameworks as expressions of timeless myths and rituals, interrupted only by the colonial encounter. African Art and the Shape of Time complicates such conventional views by considering diverse modes for reckoning time and its philosophical, social, and religious significance. Show runs through February 3. Good news lovers of all things green and art. Sue Moran and Ashley Lieber will be at the River Gallery to join you in conversation about their recent show “forest, field, farm”. You will hear all about Sue’s farm inspired shibori textiles and Ashley’s compositions of moss and lichens. Artist talk Saturday, August 18, 2pm. The Annual Summer Sale is Members Only event. Pewabic Society members can receive UP TO 50% off overruns, seconds, and imperfects, including a wide variety of gift tile, vases, and architectural tile. 10a-5p Sat Aug 18. Pewabic’s Design Team will be on-site to assist with your projects. Start Gallery is proud to present Rob Adams in his first solo gallery showing. Music and adult beverages will compliment the art on the walls. This is also an official listening party for Full Effect Records artists Marion Crane and White Pulp. Opening Saturday, August 18, 7-11pm. The Superior Bugout presents an evening with artwork by a traveling duo working under their hobo moniker aliases “Monty” and “The Boozehound” sharing their photos, sculptures, and diatribes of the road along with very loud live sounds produced by Detroit’s own Sheefy Mcfly, Pupils, Mexican Knives, LT Dan and The Sugarcoats. Opening Friday, August 17, 7pm. One night only at Motor City Brewery. Three artists: Sue Carman Vian, Rose DeSloover, Lois Teicher. Book Beat is celebrating it’s 30th anniversary and is planning a party for its patrons and the community. A large group of guest authors and artists will be in attendance to sign and meet guests including; David Small, Dan Austin, Nancy Shaw, Paul Vachon, Kathryn Madeline Allen, Jean Alicia Elster, Dan Ewald, Tracy Gallup, Kathe Koja, Rick Lieder, Cyd Moore, Denise Crittendon, Jim Gallert, Susan Whitall, Leni Sinclair, Gary & Laura Grimshaw, Tracy Bilen, John “Detroit Blogger” Carlisle, Amy Ashley, Denise Brennan-Nelson, Bill Rauhauser, and David Tarver. There will be live music, artists, authors, refreshments, prizes, a Mexican taco truck and an outdoor tent to help contain the celebration. The party is free and open to the public – come celebrate with your locally-owned, independent bookstore. Detroit’s largest ethnic festival, presented for the 30th year by the Charles H. Wright Museum of African American History, establishes a proud new tradition this Friday as it is held on the Museum grounds, surrounding streets and connecting green spaces. The City of Detroit will close adjacent streets to accommodate one of the most widely anticipated events of the summer. Friday, August 17 through Sunday, August 19, 12-11:30pm.